What a crazy question, don’t you agree? It’s not so unusual when you know the idiom, let the cat out of the bag, which is to reveal (or divulge) a secret . - Don’t let the cat out of the bag about Marco’s surprise birthday party. - Marie let the cat out the bag about her plans to elope (get married secretly) in Las Vegas. The idiom becomes clear once you know its origin: Markets in the Middle Ages usually sold livestock (such as pigs or chickens) in bags. Sometimes someone would try to cheat a buyer by putting a cat in one of the bags instead of a pig or chicken since cats were very common and easily available. 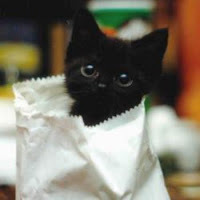 If the bag was opened in the market, the cat was out of the bag and the swindler’s secret was revealed. Have you ever let the cat out of the bag?